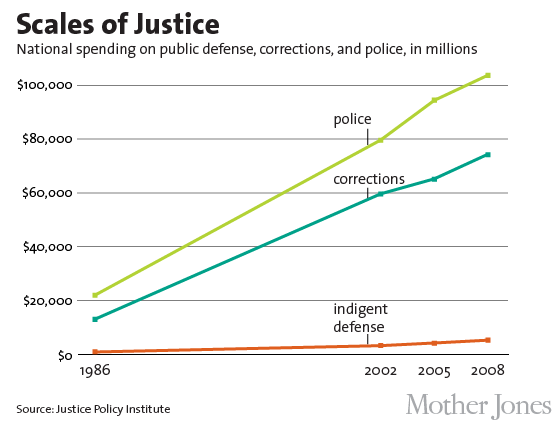 If you’re wondering why indigent defendants rarely get a fair break check out this graph. Law enforcement expansion has kept pace with an exploding prison population, but money for courts, judges, prosecutors has lagged and funding for public defenders, has hardly changed at all. The result: your public defender or court appointed attorney simply doesn’t have the time to defend you. This goes a long way to explaining why so many cases are settled by plea bargain regardless of the merits: the system can’t afford to take cases to trial even when the facts are murky. Read the full article at Mother Jones.